We understand that your needs include maintaining a professional appearance, a healthy indoor environment and extending the life of your carpets and rugs. Commercial facilities have substantial investment in their carpeting. Maintaining them properly has significant value. 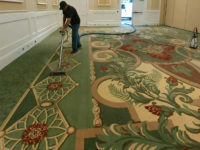 We believe that Steam Extraction Carpeting Cleaning Process is the best most thorough carpet cleaning process in our industry. Dirt and soil deposits can make carpets appear as if replacement is the only option. Steam carpet cleaning can help avoid replacement by restoring your carpets look and feel. Our powerful hot-water extraction system utilizes super-heated water to remove dirt and bacteria with minimal use of soap or harsh chemicals. Using super-heated water for restorative carpet cleaning allows us to break up dirt and grease without damaging the fibers by over-wetting your carpet. After this, powerful vacuums extract the dirt and water so you can enjoy soft, clean, odorless carpets once again. Residential Express understands that many commercial, retail, and healthcare facilities need to have constant care for their property including cleaning their commercial carpets, chair upholstery, and cubicle walls. After analyzing the wear, traffic and soil conditions of your commercial carpet, Residential Express will develop a program to properly maintain your carpet in accordance with your needs and budget and within the established standards of the carpet cleaning industry. Our ongoing maintenance services are tailored to your needs. All customized services will be provided at a reasonable monthly rate. Residential Express is a licensed and insured Carpet Cleaning Company. We have been professionally cleaning and maintaining carpets in the greater Orlando area since 2005.